The Random Writings of Rachel: So What's Next? No more detached body parts!! 1. Graduating from cosmetology school. This is a given, unless of course I get expelled before that time comes. We'll see. 2. Getting a job. Not entirely looking forward to this one but money is a convenient thing to have. 3. Visiting my family. For the first time since summer 2010. It's time. I'm so ready, and I so hope this happens this year. 4. Becoming a world-famous blogger. Oh wait. I already am a world famous blogger, I forgot. I know of people from at least three different countries in this world who regularly read my blog, and that clearly makes me world famous. So I guess the goal is to become even more world famous. 5. Finding opportunities to speak and write Mandarin. Tutoring, chatting with clients, Rosetta Stone, I'm not picky. I just don't want to get rusty. 6.Sewing more often. But not for a few months yet. The reason why I don't sew in the winter is because my office is unheated. Ya'll are lucky I have a laptop or I would only blog during the warm months, too. 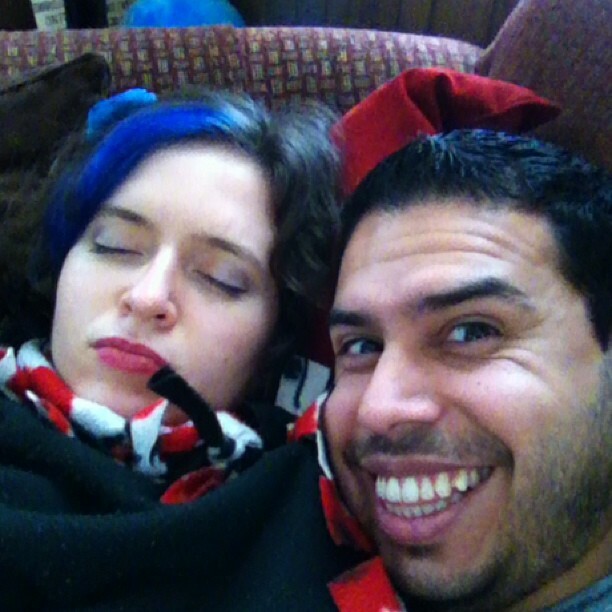 During our relaxing Sunday afternoon yesterday, Angel took this picture and posted it to facebook with the caption "Rachel was sleeping while I woke up." 7. Adventuring and laughing at and with my best friend. I think this is likely to happen, seeing as I'm nearly finished writing Angel-isms Part II already. Our dreams for the next year don't necessarily include normal newlywed things like settling down or buying a house together but it would be nice to know by the end of 2013 where we're going next. Will we? I doubt it. But there's always hope! Oh, I really hope you can make #3 happen! And I love #7 :). That last pic is hilarious! Happy New Year! Hahaha Angel's face!!! And the caption. Hilarious! I so hope you can visit your family soon. It's so hard to be far away from them! I love the last picture!! Have a wonderful New Year!! good luck with your goals! that is so funny what Angel posted on facebook - I'm laughing over here! happy 2013! You and Angel look so cute and happy together! Also, I love the blue in your hair! I guess I didn't notice when you changed it. But it looks great.